Dhaka – Family members of the head of a banned Islamist outfit met him in prison as the prison authorities have completed process for his execution, officials said on Wednesday. 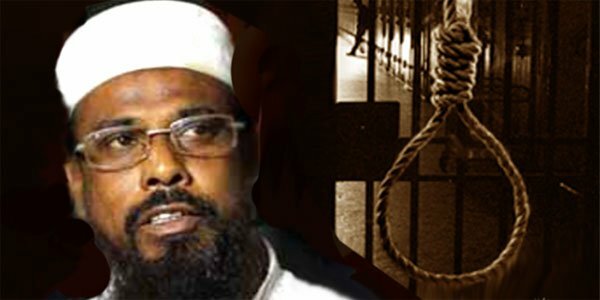 A four-member team of his relatives meet Abdul Hannan, chief of Harkat-ul Jihad al-Islami, talked to him for half an hour inside the Kashimpur High Security prison as he will be hanged at any time. Earlier in the week Home Minister Asaduzzaman Khan Kamal said his plea for clemency against death sentence was rejected by president Abdul Hamid. Hannan, who is also known as Mufti Hannan, was sentenced to death along with two of his associates for carrying out the May 2004 attack on a shrine in the north-eastern city of Sylhet that left three people killed and many others injured. The injured include former British envoy to Bangladesh Anwar Choudhury. Jail authorities confirmed that wife Zakia Parvin Ruma, elder brother Ali Uzzaman Munshi and two daughters- Nishi Khanam and Nazrin Khanam- met Hannan at the jail, where security has been tightened. They stayed for around half an hour and left the jail gate at around 8.15 this morning. Jail Super Mohammad Mizanur Rahman said they have taken all preparations to execute Hannan as per jail codes. It will be carried out anytime, he added. Gazipur police said they have taken extra measures to ensure security and prevent potential threats from Hannan’s followers or from any other groups of home-grown militants. Law enforcers have taken extra vigil at all important points in Gazipur, he added. Hannan and his associates filed petitions seeking presidential mercy after the Supreme Court last month upheld the death sentence pronounced by a local court of Sylhet in 2008. During the 2004 attack, the British diplomat Choudhury was visiting a historic shrine in Sylhet, his birthplace. Investigators said the Islamists threw the grenades at Choudhury as he left a mosque near the shrine following Friday Muslim prayers. Hannan is also blamed for a series of terrorist attacks, including an attempt on the life of Prime Minister Sheikh Hasina.